Aardman Animation’s appeal has long been rooted in its homemade craftsmanship. In the studio’s classic Wallace & Gromit shorts, it’s possible to see the thumbprints of the animators who lovingly transform lumps of clay into twee perfection. So when the studio started to incorporate computer animation in the past decade, fans grew concerned. Though 2006’s Flushed Away was far from a box-office smash, it alleviated some of those concerns: It turns out there was more to Aardman than ingratiatingly old-fashioned labor practices. In Flushed Away, the Aardman gang’s gift for dry British humor and droll understatement flourished even in the sewers underneath London. 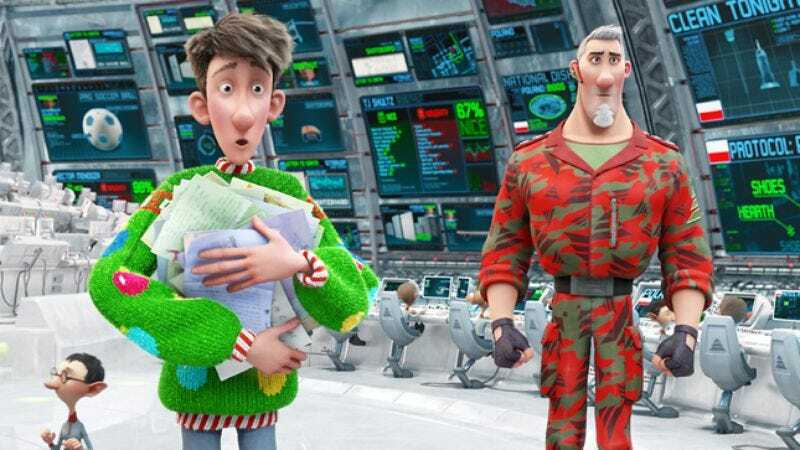 Arthur Christmas, Aardman’s maiden foray into 3-D, is set a glamorous realm far from the adorably rat-infested London sewers. The film takes place on a North Pole run with the split-second precision of a military base. Nothing is left to chance, and no child is left behind until a snafu results in a single little girl going present-less on Christmas morning. Santa Claus (Jim Broadbent) and his militaristic son/second-in-command Steve (Hugh Laurie) are willing to accept that as a regrettable loss, but Santa’s hapless other son, Arthur (James McAvoy) and Arthur’s doddering-but-spirited grandfather (Bill Nighy), a former Santa himself, decide to go rogue and deliver the present themselves in an old-time wooden sleigh that’s been out of commission since newfangled technology rendered it wildly anachronistic. The screenwriters have a lot of fun dreaming up alternate histories for their Santas. We learn, for example, that one of Santa’s flying sleighs caused the Cuban missile crisis, while some reindeer never made the journey home after encountering perilous conditions. The irascible grandfather Santa, with his free-flowing contempt for the ways of the modern world, goes a long way toward undercutting the sentimentality of a story about the importance of all children receiving the present of their dreams, as does a punky gift-wrapping elf commando with a fashion sensibility informed by the protagonist of The Girl With The Dragon Tattoo. Arthur Christmas gets a little sappy toward the end—it is a Christmas movie, after all—but it otherwise strikes just the right combination of naughty and nice, reverent and irrelevant, holiday-sweet and Aardman dry.